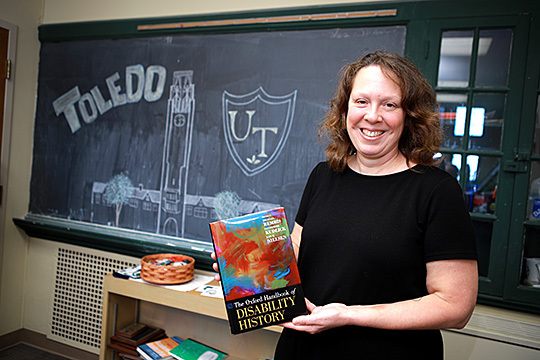 Dr. Kim Nielsen is one of three editors of the “The Oxford Handbook of Disability History” and one of 30 experts to write a chapter. The cover of the book was designed by a group of artists who work together at Shared Lives Studio in downtown Toledo. Nielsen’s co-editor Dr. Michael Rembis, associate professor in the Department of History and director of the Center for Disability Studies at the University at Buffalo, will host a public lecture at UT titled “A Fact Was No Less a Fact Because It Was Told by a Crazy Person” Wednesday, Oct. 17, at 4 p.m. in Carlson Library Room 1005. “Telling the life story of someone whose life included disability, unpacking the relationship between that individual life and its larger historical context, and analyzing the questions and insights raised by that life have much to offer scholars and readers,” Nielsen wrote. “Perkins was not disabled, but disability permeated her life,” Nielsen wrote. Nielson’s most recent book, “A Disability History of the United States,” was published by Beacon Press in 2012. This entry was posted on Monday, October 15th, 2018 at 3:51 am and is filed under Arts and Letters, News, Research, UToday .